Products derived from oil and natural gas touch nearly every aspect of your life; from the car you drive, to the power that heats your home, to the screen you are reading this blog on. As part of our new series, Did You Know?, this post provides a high level overview what oil and natural gas is and how it is produced. 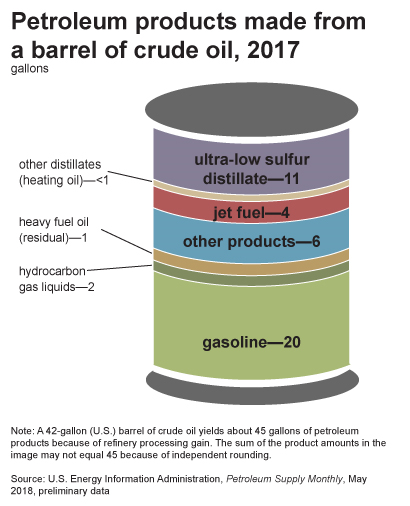 Crude oil is a liquid mixture of a variety of compounds including carbon, hydrogen, and sulfur made from organisms that lived millions of years ago. The composition of crude determines whether it is considered sweet, sour, heavy, or light. For example, “sweet” crude has a lower sulfur content than “sour” crude, and “heavy” crude contains more metallic compounds. Crude oil is found in underground reservoirs, between sedimentary rocks, or bubbling up from the ground in oil sands, and its location usually determines its chemical composition. To recover crude oil, a well is drilled deep into the ground, past layers of rock into these reservoirs. Producers drill for oil both on land and offshore. Innovations and the use of new technology, such as 3D seismic imaging, digitalization, and drones, have made crude oil production a safer and more efficient process. Like crude, natural gas is also made from organic compounds, however its chemical composition is very different. The pressure and heat variations of where natural gas is found create a substance that is mostly methane in a gaseous form, unlike crude oil. Natural gas can be found in both conventional and unconventional reservoirs. Conventional natural gas can be found in the same types of reservoirs as crude oil, and it is usually the layer above the crude oil. 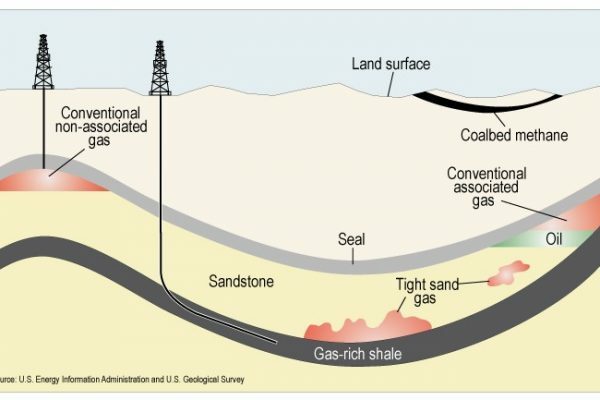 Unconventional natural gas is packed tight in between layers of shale and sand and was traditionally more difficult and expensive to produce. Once recovered, natural gas can be cooled down to very low temperatures into its liquid form, otherwise known as liquified natural gas or simply LNG, which makes it easier to transport long distances. American producers are currently making significant investments in infrastructure for LNG to export natural gas from the United States to areas with significant demand such as Asia and Europe. The use of new drilling methods combined with hydraulic fracturing or “fracking” has allowed American producers to access previously inaccessible and expensive oil and natural gas reserves. Nearly 62 percent of total U.S. natural gas production was produced from shale resources in 2017. This exponential increase in unconventional production in the United States is making our current energy abundance possible and is often referred to as the shale boom. Once oil and natural gas are recovered they are used for a variety of things. Crude oil is refined and separated into usable products, such as gasoline, diesel fuel, jet fuel, waxes, lubricants, and even asphalt. Some crude oil is refined into plastic feedstock, which is the base to all the plastic products we use. Natural gas uses range from powering industrial sectors to transportation. According to the US Energy Information Administration (EIA), one of the largest areas of natural gas consumption is used to supply the nation’s electric sector, powering our homes and businesses. The variety of uses for oil and gas show how indispensable this resource is to our daily lives, and while its production may be complex, its benefits are very straight forward.